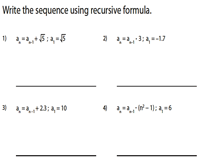 Recursive sequence worksheets provide ample practice for high school students on various topics like writing arithmetic sequence, geometric sequence and general sequence using the recursive formula, determining the recursive formula for the given sequences, finding the specific term and more. First term and the recursive formula are given. Write the arithmetic sequence using the implicit formula. 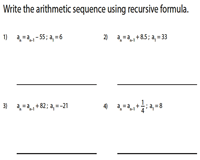 Using the first term 'a' and the common difference 'd', write the recursive formula for each arithmetic sequence. The terms of the sequence involve integers, decimals and fractions. 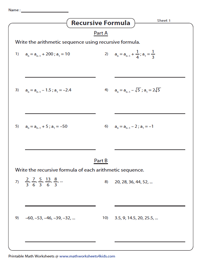 Engage these arithmetic sequences mixed review worksheets and find the arithmetic sequence using the recursive formula in part A and vice versa in part B. 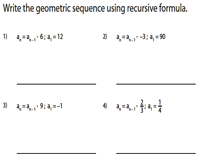 Write the geometric sequence using the first term and the recursive formula. There are ten problems in each worksheet. 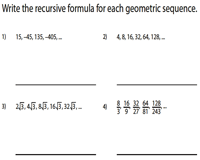 Observe the geometric sequence provided, identify the common ratio and find the recursive formula. 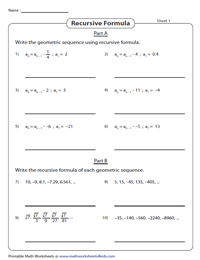 This set of mixed review worksheets contains exercises based on writing geometric sequence from recursive formula and vice versa. 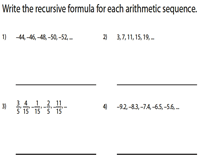 General sequence consists of numbers that are arranged in a particular order or pattern. Find the terms by plugging in the values of n in the recursive formula. 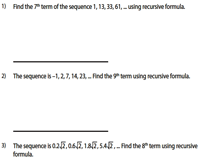 Determine the pattern followed in the sequence and write the recursive formula for nth term. Worksheets consist of 10 problems per page. 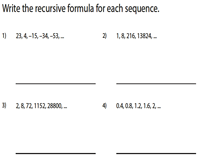 These worksheets require students to find the specific term of each sequence using the recursive formula. Problems are furnished in the word format.